This frozen summertime recipe is a snap to make. Just mix creamy vanilla pudding and yogurt, then layer in ice pop molds with fresh strawberry purée, and freeze. 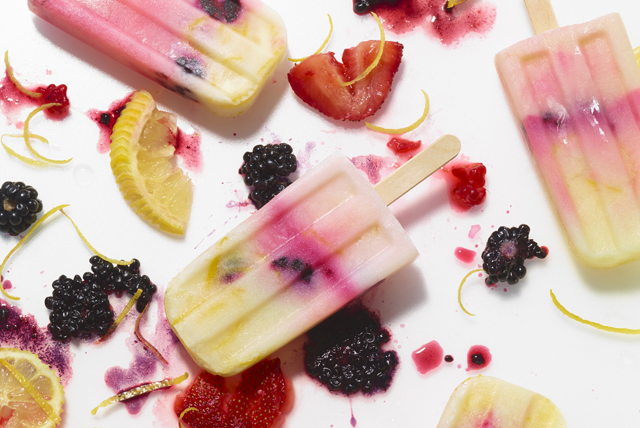 These frosty pops are sure to become a new summertime favourite. Using pulsing action of food processor to process strawberries and honey until blended; spoon into medium bowl. Add blackberries; mix well. Spoon pudding and fruit mixtures alternately into 6 frozen pop molds. Insert handles into centres of molds. Freeze 3 hours or until firm. Spoon pudding mixture into resealable plastic bag. Press excess air from bag; seal bag. Cut small piece off one bottom corner of bag; use to layer pudding mixture alternately with fruit mixture in pop molds.